It's in my blood! 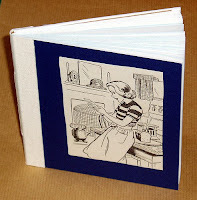 I grew up watching my grandma, mum and aunty always sewing, knitting, cooking - just 'doing'. As well as that, I grew up watching my dad constantly making things too - models, toys, furniture. 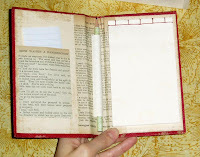 I made my first 'book' when I was 5; as a girl, I was really into sewing, drawing and constructing things with paper and wood. I also had a 'lego' obsession! I stumbled across it online and fell in love!! Not much really, just my personal making at home for family and friends. My etsy business is relatively small, so I don't need any helpers .. although my children like 'road-testing' my softies for their cuddliness! Do what you enjoy - don't compromise what you love to do - never stop learning! Finding time to devote to the joys of making things - it feeds my soul! In my senior year of high school, my teacher introduced the artform of books to me. I then went on to learn more and experiment with constructions at Uni. 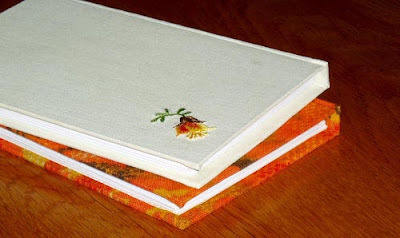 I really like Stab binding as it is reasonably easy and can look so good with different threads and colours. 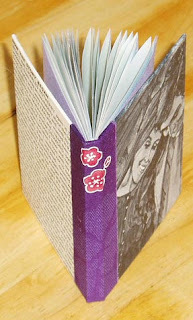 I'd love to have a go at coptic binding though. My boxes of paper and paper ephemera that I rummage through each time I make a book! I think all successful crafters who also manage to be good mums are heroes! Collecting odd bits of paper and my ever-swelling fabric stash! thanks for sharing with us, ali!